Dartmouth Players is the longest established community drama group in the area. We give our time free of charge but aim for professional standards in everything we do, normally producing 2 shows a year. Our projects range from serious plays to comedy, musical and pantomime, performed at the Flavel Arts Centre, Dartmouth, UK. Join in the fun and excitement of our creative projects. The Dartmouth Players is a friendly, go-ahead innovative theatre company, often performing original work with technically advanced multi media productions. Don’t be shy about coming forward to get involved, particularly for the annual pantomime where we try and accommodate all who are interested to take part. There are also many opportunities for work in the production team. We were formed in October 1929 by Cyril Maude,an ex professional light comedy actor/manager who had retired to Dartmouth after a stage career spanning 42 years. Over the next 90 years more than 229 productions have entertained Dartmouth audiences in a number of different locations. Our current performance space is the Flavel Arts Centre and we hold rehearsals at the Townstal Community Hall, Dartmouth. We we also store thousands of costume and props items in a newly constructed store in a loft area of the Townstal Community Hall. We a non profit making organisation with full visibility of our finances through AGM's and audited accounts, openly available to our members. We have a large quantity of costume and props. Social events are occasionally organised throughout the year. The Dartmouth Players is run by a management team. The chairman is currently Bill Hunt, Treasurer Norman Cork and Secretary Linda Churchill. Team Members are: Linda Marshall, Craig Varnham, Amy Shepard, Fred and Shaunagh Radcliffe. We have a thriving membership of around 60 people of all ages. Membership is entirely free of charge! If you would like to be a friend or join one of our projects or events , please contact us. We can put you on our distribution list. 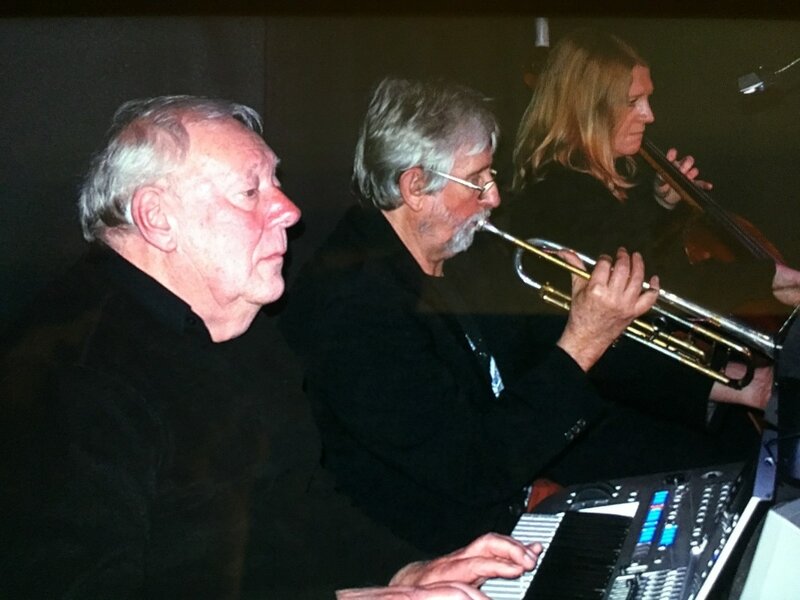 Our musical theatre projects contain original music composed by Norman Cork, seen here on keyboard with Bill Hunt on trumpet.